so in one last winter hurrah, i want to share a cold-weather wonder that is a staple around here – baked potato soup. 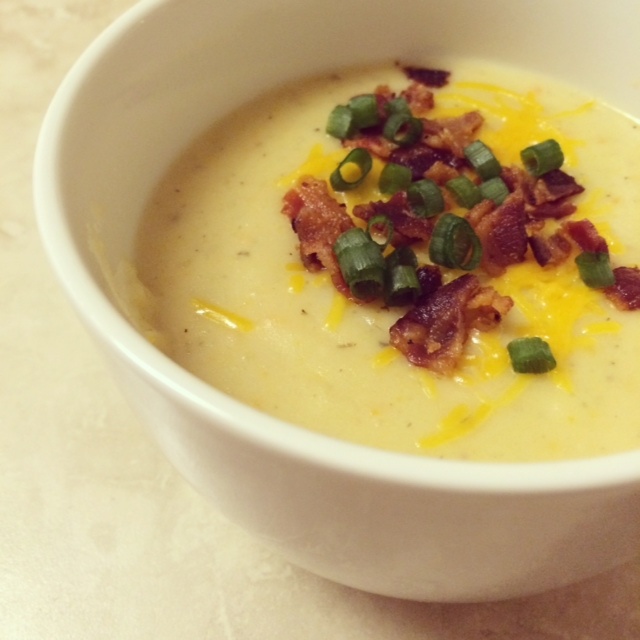 it is super thick and perfectly creamy, and topped with crispy bacon, it’s one of my favorite comfort foods. oh, and extra points: it’s always a win for me in the meat-and-potato husband department. 1. in a large pot over medium-high heat, warm the olive oil and swirl to coat the bottom of the pan. add the garlic, onion, carrots, celery, bay leaf, and thyme. saute, stirring frequently, until the vegetables are softened, about 10 minutes. 2. add the chicken stock and bring to a simmer, then simmer uncovered for 30 minutes. (the veggies should be very tender.) discard the bay leaf. add the baked & mashed potatoes, cover, and simmer for 10 minutes. 3. remove from heat and, using an immersion blender (or in batches with a blender), blend the soup to make creamy – as desired. (if you like your soup chunky or not as creamy, you can skip this step.) whisk in heavy cream, a heaping 1/8 tsp sea salt, freshly ground pepper (to taste), and return to heat, on low, for about 5 minutes. ladle soup into bowls and top with a dollop of sour cream, cheddar cheese, green onion, and crumbled bacon (about one crumbled slice per bowl). recipe makes about 6-8 bowls. keeps for 4-6 days in fridge in an airtight container. reheat in microwave or on the stove. **to bake the potatoes, i follow this “recipe” from the kitchn. they turn out perfectly every time.